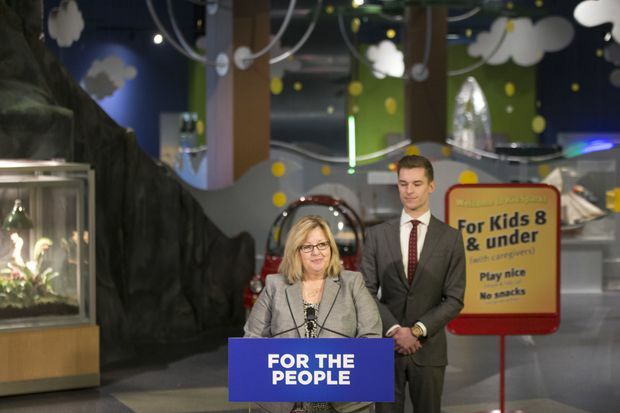 Ontario PC Education Minister Lisa Thompson stands alongside Parliamentary Assistant, Sam Oosterhoff, as she makes a statement at the Ontario Science Centre in Toronto on Friday, March 15, 2019. The Peel District School Board has issued layoff notices to almost 200 high-school teachers partly in response to class-size increases announced by the provincial government. The school district said 193 secondary teachers received surplus notices on Tuesday as a result of the loss of some funding and increases to average high-school class sizes. In addition, just over 120 elementary school teachers also received surplus notices. The Ontario government recently announced that average class sizes would increase by one student in grades 4 to 8, and to 28 students from 22 in high school. Education Minister Lisa Thompson has stressed that there would be no layoffs and that teaching positions would be lost only through attrition. The government said it would provide transitional funding to school boards to make sure that happens and extra money would be provided so that teachers in science, technology, engineering and math remain in classrooms. Jamie Robertson, the Peel board’s superintendent of human-resources support services, said layoffs will likely be inevitable because even with the transitional funding, it would not make up for the budget shortfall. And so far this year, the board has seen fewer teachers voluntarily leaving the profession, he said. But Kayla Iafelice, a spokeswoman for Ms. Thompson, said surplus notices are not unexpected at this time of year and there are other factors to consider. She said school boards will receive their funding from the government by the end of the month. The government is also providing “attrition protection” to help manage the change in high school class sizes, she said. Mr. Robertson said the attrition protection does not apply to elementary school teachers and a loss of some local funding has meant that the board issued 128 surplus notices on Tuesday. In high school, he said the attrition-protection money promised by the government would not necessarily cover the cost of other funding losses. He said for students it could mean fewer program choices. “It will be difficult to provide the pathways to the many outcomes that students require coming out of secondary school,” he said. The Ministry of Education said in a recent memo to directors of education that an estimated 3,475 teaching positions will be lost in the province through attrition as a result of changes to the average class sizes in some elementary grades and in high schools. That works out to less than one teaching position for each of the province’s almost 5,000 publicly funded elementary and secondary schools. Several school boards have said the loss of teaching jobs will be much greater over the next four years than the government’s estimates. The Toronto District School Board said it would have about 1,000 fewer teachers in elementary and high schools as a result of the class-size changes.